Lucknow : Nearly eight months after it swept the Uttar Pradesh Assembly elections, the ruling BJP continued its winning streak in the civic polls -- bagging 14 of the 16 mayoral seats, and also a sizeable chunk of the Nagar Palika and Panchayat posts, coming as a boost to the party ahead of the Gujarat polls. Still nursing the bruises of the assembly election defeat, the BSP emerged better than the other parties in the opposition - the SP and Congress, which lost badly even in its stronghold of Amethi, the parliamentary constituency of Rahul Gandhi. Prime Minister Narendra Modi congratulated the party unit in Uttar Pradesh, saying development has triumphed once again in the country. "Many congratulations to CM Yogi Adityanath & all party workers. This win motivates us to work even harder for people's betterment," he tweeted. Chief Minister Yogi Adityanath credited the victory to BJP workers who "worked to communicate the party agenda of development to all". He took a dig at Congress, saying a party which was dreaming to win in Gujarat has floundered in Uttar Pradesh. 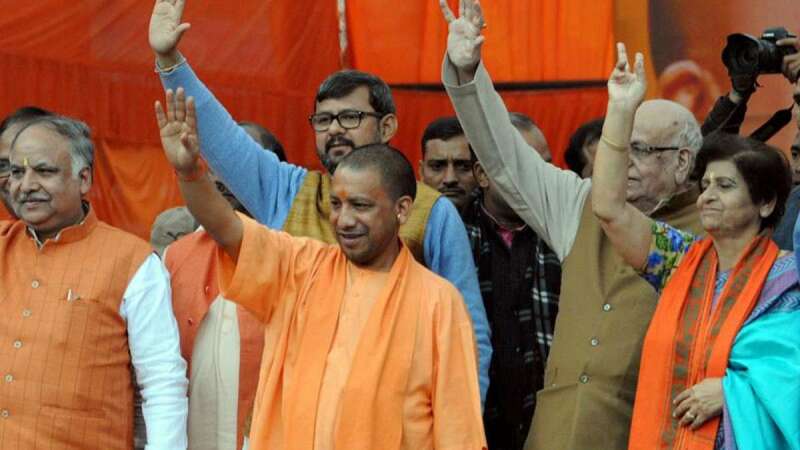 In his first comments after the BJP surged ahead to a decisive victory in the civic polls, Adityanath said the results showed that the people had faith in the party and the policies pursued by the central and the state governments. The BJP won 14 mayoral seats, while the BSP won two. BJP won in Varanasi, Gorakhpur, Ghaziabad, Bareilly, Agra, Firozabad, Ayodhya, Mathura, Lucknow, Kanpur, Saharanpur Jhansi and Bareilly, and Moradabad. The BSP won in Aligarh and Meerut. BJP's Sanyukta Bhatia will be Lucknow's first woman Mayor. She will succeed Dinesh Sharma, who served for two terms before his elevation as Deputy Chief Minister in March after the Bharatiya Janata Party victory in the Uttar Pradesh Assembly elections. Of the 198 Nagar Palika Parishad chairman posts, the BJP won 47 seats, the Bahujan Samaj party (BSP) 18, the Samajwadi Party (SP) 29 and the Congress five. Of the 5,261 Nagar Palika member seats, BJP won 624, BSP 178, SP 328 and the Congress 98. Of the 5,434 Nagar Panchayat member seats, the BJP has won 575 seats, SP 384, BSP 189 and the Congress 106. Of the 1,300 corporation seats across the state, the BJP won 535, the BSP 145, the SP 171 and the Congress 86. In the polls for the 438 Nagara Panchayat chairman, the ruling BJP won 81 seats, the SP 67, the BSP 34 and the Congress 15. The independents won 199 corporate seats, 27 Nagar Palika chairman seats, 2,533 Nagar Palika member seats, 144 Nagar Panchayat chairman seats and 3,291 Nagar Panchayat member seats. However, a BJP candidate lost to an Independent in Gorakhpur's Ward number 68, where the Gorakhnath Peeth is located. Chief Minister Adityanath heads the Gorakhnath Mutt and has been a Member of Parliament from Gorakhpur in eastern Uttar Pradesh for five consecutive terms since 1998. The Bharatiya Janata Party won 27 wards in Gorakhpur, the Samajwadi Party 18, Bahujan Samaj Party two, Congress two, and independents 18. Not only did independent Nadira Khatoon defeat BJP's Maya Tripathi by 483 votes in Ward number 68, its candidate Prashant Kesari lost in Deputy Chief Minister Keshav Prasad Maurya's hometown Sirathu's panchayat to independent Bhola Yadav.